Today 90% of all home Buyers start their search for their Next home on the Internet. on Major Real Estate Search Engines, Real Estate Blogs and Websites. We're ranked on the first page in Google under many popular search terms like Victoria Real Estate Oak Bay BC Real Estate Victoria Homes or Victoria BC Real Estate, James Bay Real Estate Fairfield And Rockland Real Estate just to name a few. I'll show You my Internet Sales and Marketing Real Estate Secrets that are often missed or avoided and Sell YOUR Home Fast and for Top Dollar! Have YOUR Home Marketed 24/7 on the World Wide InternetEveryday until Your Home is Sold! 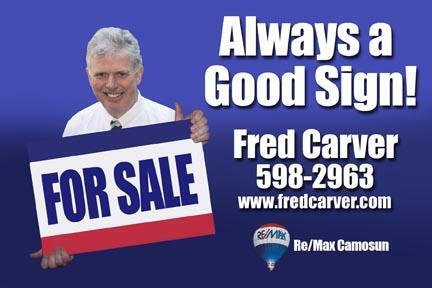 You will see Positive Results in the time frame to meet YOUR needs with yours truly...Fred Carver, 39 years helping Clients Sell and Buy Real Estate Throughout Victoria BC and the World. My pledge to You is "Promises Made Promises Kept" Experience does make a difference when selling Victoria BC real estate. Victoria Real Estate Selling is now about marketing, curb appeal and pricing……. Going out to find buyers is what works, and not waiting for potential home Buyers to call me. An estimated 90% of home buyers look online first. For example by using Key words in my online market brings home buyers Locally and from afar. For Example: Google Search ….one of my recent Condominium listings at 306-949 Cloverdale Top Floor 2 bedroom condo Victoria BC , Google any of this description and it’ll come up on the top of the Google search engine page. I do this with all my Listing, to help bring Local and Distant Buyer to your Listing...I figure we need every person that is wanting to Buy a home like yours, to know that you home is For Sale. Buyers can find and View your home 24/7 with my home features and multi-picture and virtual tours on Google, my Web sites and Blogs. Home Buyers are Comparative Shoppers, they know what they want, and they are looking for a good deal. Correct home for sale pricing will bring a serious home buyer to the table, for any property including luxury and waterfront homes for sale in Victoria BC. This is just a tip of my proactive marketing to Sell your home quickly and for a Top Price. Successful online marketing Selling Victoria Real Estate, by using Internet marketing for my clients. I use Canada Posts (snail mail) such as Just Listed Announcement of Your Home For Sale throughout Your neighbourhood, as many Neighbours may have family or friends wanting to live in your area. Marketing direct to hundreds on Active Victoria Realtors who have potential Buyers for Homes Like Yours. I do All of this and much more to aggressively prospect to find Victoria home Buyers for your home. Plus I report to you on a regular basis even if there is no news. We'll Work as a Team. Gone are the Days... A Realtor can Post a house for sale sign on the lawn, put the home on MLS and Wait at Open House’s for a Victoria home Buyer…NOW Real Estate Selling is about being proactive by going out and finding qualified buyers for homes in Victoria BC. For Example: the Condo above had 800 visitors in the first few days of my marketing, an acceptable offer came in quickly. The most important is pricing a property in the right range, having the right appealing curb appeal and aggresive internet marketing. Home Buyers are comparative shoppers. When two or more home Buyers like the same house because of price and curb appeal, then we'll get an bidding war. My Marketing and Advice will bring a lot of attention to your home when you ask me to Sell it for you. Call 250-598-2963 or Email me fredcarver@remax.net if you have any questions and to arrange a date and time to meet to find how I can Sell your home too. Here is what a few past clients have to say about my services, marketing and selling their homes and properties. Sincerely, Marlene Summers, Victoria, B.C.